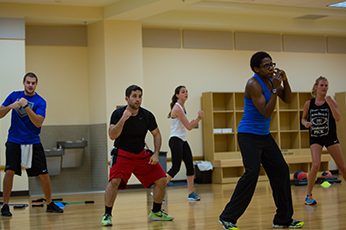 UM provides students with a range of options to maintain or pursue a healthy lifestyle. The Coral Gables campus is home to the Patti and Allan Herbert Wellness Center, a premier fitness, recreation, and wellness facility that includes a 17,000-sq. ft. fitness room, basketball courts, indoor track, spa, saunas, racquetball and squash courts, instructional kitchen and classrooms, tennis courts, an indoor pool, and the Courtside Eatery. Since it takes more than just physical exercise to maintain good health, the Wellness Center also offers classes in meditation, stress management, smoking cessation, cooking, emergency care, and nutrition education. If you are interested in a team atmosphere, be sure to check out our Intramural Program as well as our Club Sports Program. The Intramural Program offers participants the opportunity to play competitively or recreationally in a variety of sports and activities such as flag football, soccer, basketball, softball, tennis, volleyball, and racquetball, among others. The Club Sports Program provides diverse, competitive sports opportunities for students across a broad range of skill levels and experiences and includes activities such as aikido, badminton, sailing, SCUBA, fencing, golf, lacrosse, and rugby to name a few. To learn more, click on Health & Wellness at UM.